In idiopathic pulmonary fibrosis (IPF), home monitoring experiences are limited, not yet real-time available nor implemented in daily care. We evaluated feasibility and potential barriers of a new home monitoring program with real-time wireless home spirometry in IPF. Ten patients with IPF were asked to test this home monitoring program, including daily home spirometry, for four weeks. Measurements of home and hospital spirometry showed good agreement. All patients considered real-time wireless spirometry useful and highly feasible. Both patients and researchers suggested relatively easy solutions for the identified potential barriers regarding real-time home monitoring in IPF. Idiopathic pulmonary fibrosis (IPF) is a progressive, devastating disease with a poor prognosis . Symptoms as increasing shortness of breath and immobility make regular hospital visits a challenge for many patients. New eHealth technologies hold great potential for research and care by facilitating real-time, frequent data collection at home. In IPF, home monitoring experiences are limited and not yet implemented in daily care. Few studies using daily handheld spirometry have been performed in patients with IPF [2, 3]. These studies showed that home spirometry in IPF is feasible, may allow for better disease prediction and decrease sample size for future trials [2, 3]. However, earlier studies using home spirometry in interstitial lung diseases used paper-based collection or central read-out of Forced Vital Capacity (FVC) results [2–4]. This limits possibilities to control quality of measurements, or respond directly to FVC decline or non-adherence. We assessed feasibility of a pre-developed home monitoring program in IPF , integrated with real-time, wireless home spirometry. Furthermore, we evaluated potential barriers and solutions for implementation of wireless home spirometry in this mostly elderly patient population. This was a prospective pilot study at the Erasmus Medical Center in 2017. Consecutive outpatients with IPF were invited to participate. Approval of the Medical ethics committee was obtained, and participants provided written informed consent. Patients were asked to test the home monitoring program “IPF-online” (http://www.ipfonline.nl) for four weeks on a tablet. IPF-online is a secured online personal platform, following European safety regulations. The program consists of daily home spirometry, online patient-reported outcomes (PROs) at baseline and after four weeks, weekly reporting of side-effects and symptoms on visual analogue scales, an information library, medication coach and eConsultations. The bluetooth-enabled spirometer (MIR Spirobank Smart, Italy) transmits data real-time via a secure encrypted connection, enabling patients and healthcare providers to access data directly (Fig. 1). The system generates email alerts when patients report bothersome side-effects or FVC declines > 10% for three consecutive days. If patients fail to perform spirometry or record symptoms, they receive a reminder. Incorporated PROMs are King’s Brief Interstitial Lung Disease health status questionnaire, Hospital Anxiety and Depression Scale, Euroqol 5D-5 L and an evaluation questionnaire [6–8]. 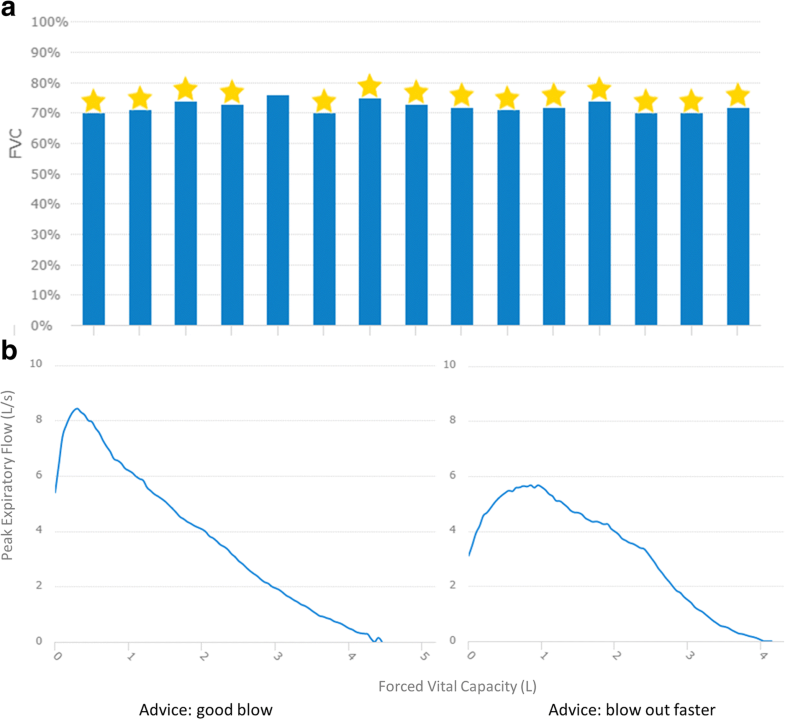 At start, patients received standardized instructions about the correct use of home spirometry and the different components of the online tool. Patients were considered trained when they were able to perform three good, reproducible FVC measurements, with less than 150 ml difference in the two highest FVCs. Before start of the study, potential barriers of the system were identified based on literature and own experiences. At baseline, potential barriers were discussed with patients. After four weeks, their experiences and suggestions were evaluated. Furthermore, patients performed hospital spirometry at baseline and after four weeks. Pearson correlation and Bland-Altman plots were used to compare home with hospital spirometry, Wilcoxon signed ranked test was used to compare baseline with follow-up scores. Data are presented as mean (SD) or median (range). Of 12 patients invited to participate, 10 patients were included (9 men), with a mean age of 71 years (5). All patients were on disease-modifying medication (60% nintedanib, 40% pirfenidone). The mean FVC was 3.28 L (1.04) or 79% of predicted (16). Measurements of home and hospital spirometry for FVC (r = 0.94 (p < 0.001)) and FEV1 (r = 0.97 (p < 0.001)) were highly correlated, and a Bland-Altman plot showed good agreement (Fig. 2). Median difference between hospital and home spirometry was 0.22 L (0.01-0.69 L) with overall lower readings for home spirometry. To evaluate within-subject reproducibility, the median SD for 28 measurements was calculated (0.13 L (0.05 -0.39 L)). The median coefficient of variation was 3.76% (3-12%). The vast majority of patients considered daily spirometry easy (80%) and not burdensome at all (90%), the other patients were neutral. The mean adherence to home spirometry was 98.8% (2.5). Most patients (80%) found it pleasant to see their FVC results, 20% was neutral. All patients considered real-time spirometry useful and would recommend it to others, 90% wished to continue home monitoring after the pilot: “It helps me feel more in control”, “I like to monitor my own disease and be monitored” and “I hope this program can replace outpatient clinic visits in the future”. Daily home monitoring did not lead to higher anxiety levels (HADS anxiety score at baseline 4.5, score after 4 weeks 4.3, p = 0.57), and quality of life remained stable (K-BILD total score at baseline 59.2, score after 4 weeks 60.3, p = 0.65). Table 1 provides a comprehensive overview of potential barriers, experiences and solutions for use of the home monitoring system. Patient who never used internet before had no problems using the tablet and perform spirometry because of the simple design. All patients performed mostly good quality flow volume loops, which could be checked real-time. A few patients had to get used to handheld spirometry the first days. Only one patient had variable results, due to technical difficulties with the standard mouthpiece. After providing an additional mouthpiece the readings were comparable to hospital readings. - Provide a clear instruction manual and good training at start of the study. Patients should be able to perform 3 good quality measurements with ≤150 ml difference in the 2 highest FVC’s. A 6 s countdown and FVC target value is always shown during a forced expiration. This motivated patients to blow as good and long as possible. Some patients mentioned more urge to cough compared to hospital spirometry, but one measurement a day was not a problem at all. Anxiety and depression scores were not higher after this short pilot. Almost all patients considered it pleasant to see their daily results. None of the patients in the pilot considered once daily spirometry bothersome, because it was not time consuming and became part of their routine. Patients got motivated by keeping track of their own results and almost all patients continued home spirometry after the pilot. This pilot study shows that a home monitoring program integrated with real-time wireless home spirometry is feasible in patients with IPF. In line with other studies, home-based measurements were slightly lower than hospital-based FVC, which may partly be equipment-related, but also effort-related [2, 4]. We tried to minimize the risk for ‘underperforming’ at home by motivating patients through graphically displaying their personal target value and prior results, a six seconds countdown and advices to technically improve the measurements. 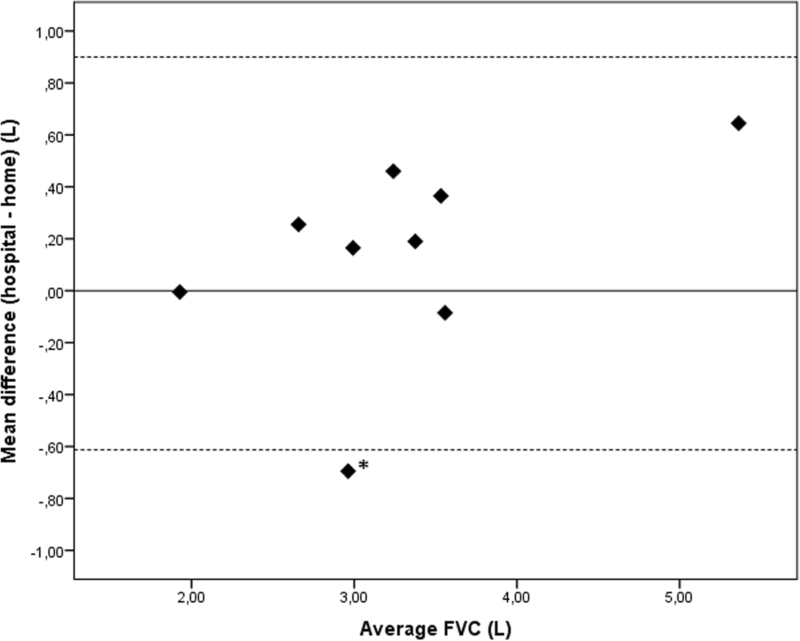 However, home and hospital readings are highly correlated and the relative variability of home-based FVC is low, indicating that home spirometry is a reliable tool to monitor patients at a distance. In a patient population with progressive breathlessness and decreasing mobility this enables close monitoring, while lowering the burden of hospital visits, especially in countries with long distances to the hospital. Moreover, real-time uploading of results and automated email alerts not only allow quality review of measurements, it also enables real-time detection of FVC decline. For example, we already observed a decrease in FVC two days before a patient reported symptoms of a respiratory tract infection. Early detection may potentially improve efficiency and quality of care for patients. Besides spirometry, patients also recorded symptoms and validated questionnaires online, which could be important additional features for future studies. All patients in our study supported the usefulness of home monitoring, and appreciated being actively involved in monitoring their disease. One patient experienced technical problems with spirometry, highlighting the importance of good instruction. No effects on anxiety or quality of life were observed, however, we believe that the duration of the study is too short to draw definite conclusions on this. We found no major barriers regarding use of real-time wireless home spirometry; relatively easy solutions were suggested by patients and investigators for potential issues. A limitation of this study is that it is a single center study, with 10 out of 12 consecutive patients willing to participate. In the Netherlands, use of internet amongst elderly people is rather high, however, also in other countries internet use among people over the age of 65 is steadily growing . With worldwide increasing internet use and technological advances, we envision that relatively simple and low-cost systems like this, will facilitate access to care and research for a wider group of patients, also in remote areas and lower socio-economic settings. Further limitations of this pilot are the small sample size and short duration. Although this was sufficient to evaluate reliability and potential barriers of a home monitoring program with real-time wireless home spirometry, larger studies are required to assess whether it improves care, allows for earlier detection of exacerbations, and enhances data collection in clinical trials. A home monitoring program including wireless home spirometry, is highly feasible and appreciated by patients with IPF, and enables real-time detection of change in FVC and PROs facilitating personalized care. The authors thank the patients who collaborated with us in this study for their valuable input and suggestions to enhance the home monitoring program. This study was supported by a grant from the Erasmus MC Thorax Foundation. Hoffman la Roche and Boehringer Ingelheim provided an unrestricted grant for software development. None of them had any influence on the design, content and conduct of the study. All authors were involved in the design of the study and data collection. CM and MSW analysed and the data and drafted the manuscript, MW, JM, JG and PP revised it critically for important intellectual content. All authors read and approved the final manuscript. Approval of the Medical ethics committee of the Erasmus Medical Center in Rotterdam was obtained (MEC-2017-388), and all participants provided written informed consent. CM, MW, JM, JG and PC declare no conflicts of interest. MSW reports grants from Erasmus MC Thorax Foundation, Hoffman- la Roche, and Boehringer – Ingelheim related to the submitted work, and other from Galapagos, outside the submitted work. Johannson KA, Vittinghoff E, Morisset J, Lee JS, Balmes JR, Collard HR. Home monitoring improves endpoint efficiency in idiopathic pulmonary fibrosis. Eur Respir J. 2017;50(1). https://doi.org/10.1183/13993003.02406-2016. Broos CE, Wapenaar M, Looman CWN, In 't Veen J, van den Toorn LM, Overbeek MJ, Grootenboers M, Heller R, Mostard RL, Poell LHC, et al: Daily home spirometry to detect early steroid treatment effects in newly treated pulmonary sarcoidosis. Eur Respir J. 2018;51(1). https://doi.org/10.1183/13993003.02089-2017. Moor CC, van Manen MJG, Tak NC, van Noort E, Wijsenbeek MS. Development and feasibility of an eHealth-tool for Idiopathic Pulmonary Fibrosis. Eur Respir J. 2018;51(3). https://doi.org/10.1183/13993003.02508-2017. Eurostat Internet access and use statistics - households and individuals. http://ec.europa.eu/eurostat/statistics-explained/index.php/Internet_access_and_use_statistics_-_households_and_individuals. Accessed 21 May 2018.